Eating for optimal health and fitness doesn’t have to be boring. Just the opposite in fact! With a little know how and an array of awesome kitchen tools, you can easily cook delicious and healthy food. Just like a carpenter needs to stock his toolbox with the right hammer and nails for the job, the fitness chef needs to ensure that their kitchen is stocked with the right culinary tools to make eating healthy easy! 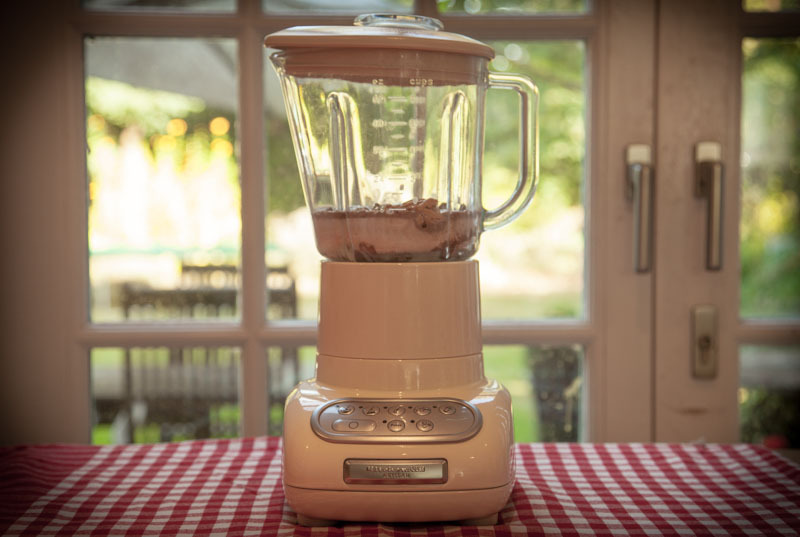 A powerful blender is a must for making protein shakes and healthy smoothies and soups. Creamy soups tend to get a bad reputation because traditionally they are served chock full of heavy cream and butter. With a powerful blender, however, you can get a silky smooth sweet potato or butternut squash bisque without using any cream or butter. If you want to take a shortcut when whipping up a smoothie or a soup recipe, consider an immersion blender. This handy gadget allows you to conveniently blend a smoothie right in your glass without having to add the ingredients into a separate blender jug. Nonstick pans allow you to cook without added oil or fat, letting you create flavorful dishes with no added calories if you are following a low calorie diet. Eggs, veggies, and meats turn out wonderfully when cooked low and slow in a nonstick pan. 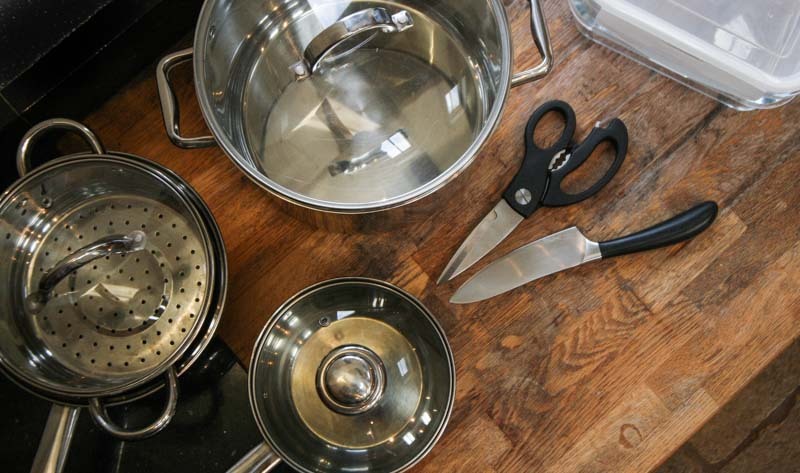 Aside from not having to worry about added calories from oil or butter when cooking with nonstick cookware, you also don’t have to worry about a difficult clean up. Though the nonstick coating on these pans is delicate, there is little need to scrub because food doesn’t stick! A good fitness chef’s kitchen could also benefit from a grill pan. Grilling meat prepares it healthily and tastily without added fats. A grill pan allows you to make scrumptious grilled chicken or shish kebobs year round. Planning is key for the fitness chef! We pretty much live by the saying “fail to prepare, prepare to fail.” Having healthy food ready to go at all times makes staying in great shape a whole lot easier. A great way to do this is to cook for the week on Sunday and portion out your meals for each day (learn more about meal prep HERE). 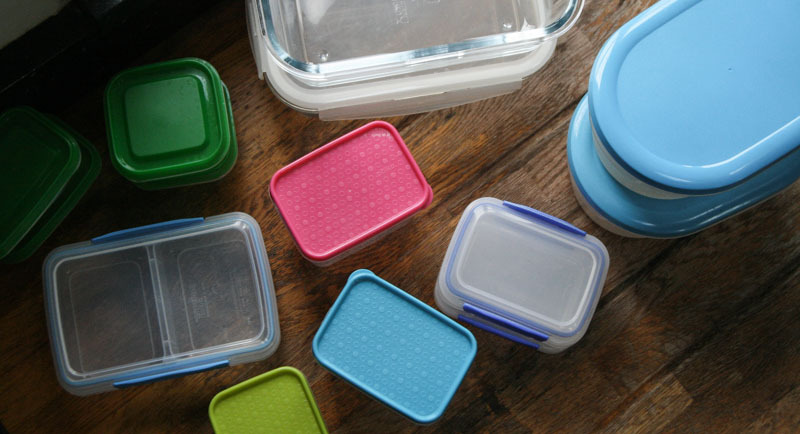 Tupperware, in all shapes and sizes, is vital for storing your prepped food so that you can eat healthy all week long even when you’re busy! A good set of knives may not be something you would think is needed in the fitness chef’s kitchen, but it does make food prep much easier. Upgrading to a good quality knife set makes preparing food faster and means you’re less likely to resort to fast food or prepackaged meals. Cutting a tomato with a dull knife is an exercise in frustration and results in an unappetising, bruised and leaking fruit. However, a sharp knife will cut the tomato cleanly without squeezing all the flesh out or bruising it, making the job much easier and resulting in a more pleasing presentation. Technically, spices could be considered an ingredient, but having a variety of spices is crucial if you want to cook delicious, healthy meals! Herbs and spices add tons of flavour without adding calories, sugar or bad fats, plus many come with health benefits too! Having a variety of herbs and spices will prevent you getting bored of clean eating because you can constantly experiment with new flavours. Measuring spoons and cups are not only crucial for following a recipe to the letter, but they’re also useful for proper portion control. A half cup of rice might become a full cup and a tablespoon of olive oil can easily become three tablespoons if you pour rather than measure. Bottom line, measuring spoons and cups will ensure your recipes turn out right and ensure you hit your calorie and macro targets. A quality pair of kitchen shears is a worthy addition to the fitness chef’s kitchen. Kitchen shears allow you to easily trim excess fat from meat, trim the ends off fresh vegetables like green beans or snap peas and are handy for snipping fresh herbs. Trimming excess fat can reduce the calories from a piece of meat, and being able to easily prepare fresh vegetables makes you much more likely to add them into your diet. Adding fresh herbs to your food fills your plate with flavour as well as vitamins and minerals! Another portion control and planning tool, nonstick muffin tins make a versatile addition to the fitness chef’s kitchen. While making a traditional sugar-filled muffin recipe is not recommended for those health conscious cooks, you can try out our Protein Carrot Cupcake recipe! You can also try making a grab and go breakfast out of eggs, sweet potatoes, black beans, and a bit of cheese which can be baked in a muffin tin. Each egg muffin can then be reheated throughout the week and there is built in portion control.